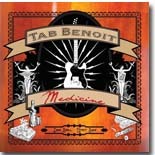 The master of swamp blues, Tab Benoit, is back with a new CD, Medicine, and it's a very good one. It's this month's Pick Hit. This month's Surprise feature, Shiver, is the 16th album of the 25-year-history of Too Slim and the Taildraggers. If you haven't yet picked up on this band, Shiver would be a great place to start! We look back at a pair of CDs from legendary Chicago blues piano man Otis Spann for our Flashback feature. Our What's New section features new releases from Al Basile, Steve Miller Band, Hadden Sayers, Big Head Todd and the Monsters, Daddy Mack Blues Band, Tommy Lee Cook, Dana Fuchs, Lloyd Jones, SharBaby, and more.